Celebrate God’s faithfulness as you visit biblical sites with a worshiping band of pilgrims who seek the peacemaking way of Jesus. 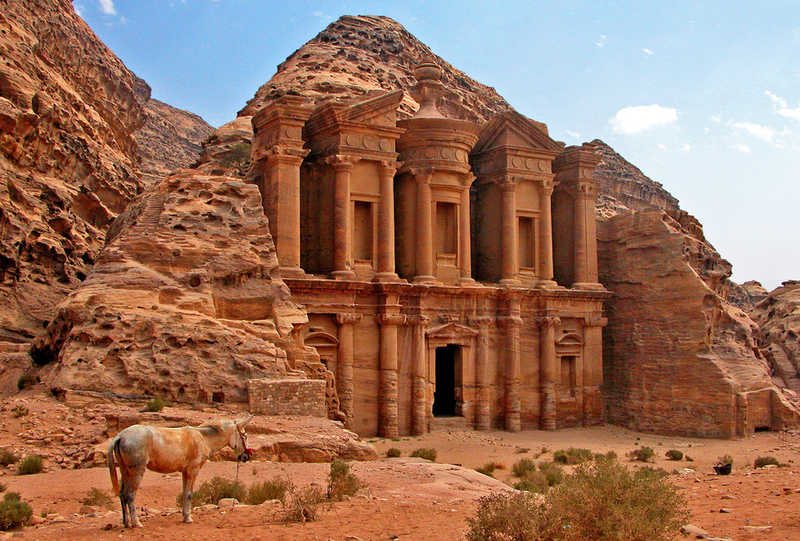 Follow the Israelites’ route to Canaan and see fabulous ruins of Petra. Stand atop Mt. Nebo from which Moses viewed the land and descend to the Jordan where Joshua parted waters. Walk where John baptized and climb to the fortress where he died. Sing carols at Bethlehem, pray at the Western Wall in Jerusalem, go to the Upper Room, and share communion at a first-century garden tomb. Explore Nazareth where Jesus was raised, hear beatitudes on a hill next to Capernaum, and ascend to heights of Masada. Renew your commitment to mission at Caesarea where Peter shared the gospel with a centurion. Nelson Kraybill will guide this journey with pastoral sensitivity and reflection on current justice issues. Arrive in Amman, Jordan, settle in to your hotel, and gather to enjoy the first of many meals together. With a population of more than 2 million, Amman is the political and cultural centre of Jordan. It is also one of the oldest continuously inhabited cities in the world. Tour the ancient Citadel of Amman and the Roman city of Jerash. Depending on availability, you may have the opportunity to watch a chariot race in the ancient Jerash Hippodrome. Then meet with MCC workers at the MCC Jordan office to learn about their important work in the Near East. Ascend the heights of Mount Nebo, where Moses surveyed the Promised Land that he could not enter. See Herod the Great’s mountaintop fortress of Machaerus, likely where John the Baptist was killed. Stop at the Byzantine Church that contains the oldest map of Palestine, dating to the 6th century. Follow the ancient Kings Highway south into the biblical land of Moab—home of Ruth from the Old Testament. Learn about the Israelites’ trek through this region on their way to the Promised Land, as well as the story of Balaam and his talking donkey. Stop for the night in Petra (called Seir in the Bible). Take in the grandeur of Petra, an ancient trade centre and burial grounds of the Nabataean people during New Testament times. See amazing temple-like tombs chiselled from rose-coloured sandstone at this world-famous site. Then travel to the Dead Sea and if time allows, relax as you float in its buoyant salty waters. Enjoy the Jordan River valley, site of many pivotal biblical events. See where the Israelites crossed into the Promised Land and remember that God miraculously parted the waters for his chosen people. View the traditional spot where Elijah was taken up to heaven in a fiery chariot. See where John the Baptist preached in the wilderness and where the heavens opened as Jesus was baptized. Visit Lot’s cave and museum to remember the story of Lot at Sodom. Cross from Jordan into Israel on the Allenby Bridge. Journey up Mount Carmel, where Elijah met the prophets of Baal, and take in views of the splendid Jezreel Valley. Then tour Nazareth Village, a living history museum of a first-century hamlet. Learn more about the life and teachings of Jesus as we see what his childhood hometown might have looked like and go on a guided parable walk. Enter a replica of a first-century synagogue. Explore nearby ancient Sepphoris, where Jesus may have been employed as a young man. At the Church of the Annunciation, remember Mary’s visit from the angel Gabriel foretelling the birth of the Christ child. Journey to Caesarea, where Peter shared the gospel with the centurion Cornelius. See the aqueduct built by Herod. Survey the landscape of Jesus’ ministry from a boat on the Sea of Galilee. Recall episodes from Jesus’ life on Earth as you visit the Mount of Beatitudes, Capernaum, and the Church of the Loaves & Fishes. Enjoy a St. Peter’s fish lunch. Stop at Harod Spring, where at God’s direction, Gideon chose soldiers by seeing how they drank water from the spring. Go to the foot of Mount Gilboa, where Saul fell in battle, and to ancient Jezreel—where King Ahab seized Naboth’s vineyard. After passing through the Jordan Valley to ancient Jericho, ride a cable car up the Mount of Temptation. Along the steep road to Jerusalem through the desert, remember the unfortunate man who was helped by the Good Samaritan in the famous parable. Travel to Bethlehem for a look at the Church of the Nativity and Shepherds’ Field. Visit the Herodion fortress, with Herod the Great’s tomb. At the Israel Museum, an extensive model will give you a bird’s eye view of ancient Jerusalem. Also, see the Shrine of the Book. See the Pool of Siloam at the edge of the Old City of David, which was rediscovered and excavated in 2004. Step into medieval building with an Upper Room commemorating the Last Supper. Take part in communion in the Garden Tomb. Head down to the desert for a visit to Masada, the magnificent site of Herod’s palaces and of the last stand of the Jews who rebelled against Rome (AD 66-73). At Qumran, survey the ruins of the first-century radical Jewish community in the desert that produced the Dead Sea Scrolls found in caves nearby. Later, learn from MCC workers in Jerusalem. From the Mount of Olives—where Jesus often retreated—get a panoramic view of Jerusalem. Pray in the Garden of Gethsemane. Pause at the Western Wall (also known as the Wailing Wall) in the Old City. Walk along the Via Dolorosa, and visit the Tower of David Museum to see the Kishle—the possible location of the Praetorium where Jesus faced Pilate. Reminisce about your tour over a farewell dinner together. Depart Tel Aviv for North America. Travel home with rich new insights about your faith and the Bible.